• Cut the balloon in half. • Discard the piece with the neck on it. • Take the remaining piece of the balloon and stretch it across the glass or jar. • Keep it stretched firmly across and seal it down with the rubber band, around the rim of the glass jar. • Tape the straw onto the balloon lid; the straw should be sitting one quarter of a way on the lid, with the tape about 1 inch from the edge of the straw end that is sitting on the balloon lid. The straw is your indicator “needle”. • Trim the straw if it’s too long, but leave more length off the jar as what is attached to it. 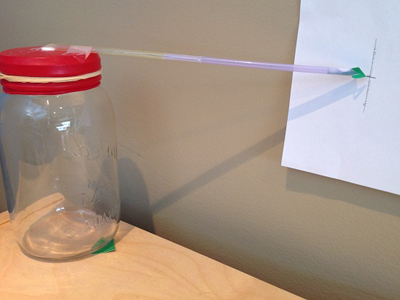 • Put the finished glass jar next to a wall and tape a piece of paper or card to the wall behind it. • Mark the current position of the straw on the paper, and mark one above and below the mark, about the same length away, and label the high and low pressure. • Check the straw regularly and keep marking its location on the paper for a few days.